I was pleased to receive feedback to my last newsletter (March 2015). There were two notable responses to my call to exterminate Mallard ducks and their hybrid offspring from all nature reserves. Cosimo Brescia, MD of Sandown Travel, plans to organise Italian hunters to do duck shooting safaris to solve our problem and Delina Mnisi, our chef at Tremisana Lodge, has been enquiring from each and every Chinese tourist exactly how best to prepare Peking Mallard. Perhaps the most interesting comment came from Father Christopher Neville OFM who suggested that the Rhodes statue deserved to be pulled down simply on the strength of his having introduced alien animals ! As if South African tourism hasn’t struggled enough with the effects of Ebola, we are now struggling with repercussions of Xenophobia. We must guard against making potential guests feel unwelcome and unwanted. Perhaps we are overreacting when the Chinese tourists that advise Delina about culinary treats such as Peking Mallard are suspiciously viewed as potential rhino poachers. I was pleased to enjoy a great sighting of White Rhino at Tshukudu Game Lodge, where I conducted a safari last week with Martin Spahn who was on his fourth safari with Viva Safaris. He really loves our product and this time stayed for 2 weeks ! I have decided that, starting with this and all future newsletters, I will edit our guides’ game viewing reports so as not to indicate the exact locations where Rhinos are being sighted. One never knows whether this newsletter is read by a potential poacher ! The past few years have seen considerable amounts of summer rain. This year however it has not been as wet – it’s very evident at the majority of the water holes. What this means is that there is a lot more animal activity around the water points. Elephants and buffalo are heavily dependent on water. Buffalo can be seen heading for water first thing in the morning and then later on in the afternoon. The older buffalo often remain in the vicinity of water, spending a lot of their time lying in muddy puddles which helps to cool them down and controls nasty little insects. Elephants are a wonderful sight at the waterhole and this month we’ve been lucky to see large herds round numerous water holes. The herd is led by one of the older females, who ensures the herd gets what it needs to survive. Once they reach the water, the whole herd enjoys a much needed drink, with some moving right into the water, getting deep enough to cover their massive bodies. The fun and games continue until the leader feels it’s time to move on. With a low stomach grumble, she tells the herd it’s time to go and slowly but surely all the elephants begin to leave the water. The youngsters run with ears flapping towards their respective parental figures, while the young teenage males lag behind sneaking in one last splash of water. The beautiful expanses of open grassland around Satara provide a perfect habitat for White Rhino. It was while headed towards a lion sighting that we managed to spot a few large grey humps in the distance – I knew it couldn’t be anything other than a crash of white rhinos. We sat and waited as they drew nearer, slowly moving towards us, munching away at the grass. Such a beautiful sighting – it’s a shame so many are being poached for their horn every year. The current average is 3 rhino per day, a terribly scary thought. In search of the lions we went – Kumana Dam was our destination. On arrival it was evident that something was worth watching, with the cars lining the road on the dam wall. A lion and lioness were sitting in the shade of a Marula tree. They had positioned themselves in the tall grass, looking onto the water hole. The animals around the water all looked very nervous, except for a few big bull buffalo, who didn’t seem very worried at all. The lions suddenly went into crouch mode, and all we could see were their ears in the tall grass. A small herd of zebras approached the water for an afternoon drink. They seemed oblivious to the fact that two lions were watching their every move. The one lion made the fatal move of being too eager – the zebras picked up the danger immediately and froze on the spot. The lions had lost their advantage, the zebras survived. It was a great way to spend an afternoon, and to make it even better, another lioness appeared on thr road. My guests were given a wonderful show – it was exciting to watch. The leopard has to be one of my favourites, despite it being not an easy animal to find, which makes it such a wonderful animal to see. It was while driving along the Timbavati River that we received a tip from a passing tourist regarding a leopard sighting. It wasn’t long before we came to the location, and there, sitting in a Jackalberry tree, was a young leopard. We drew up near the tree and admired how beautiful the young leopard was. My guests managed to get some great shots of the leopard dozing off in the tree, with no worries in the world. Yet another brilliant and unforgettable day in Kruger Park !!! At beginning of the month it was dry and easy to find animals around the water, but in the middle of the month everything was changed by the rain. It was unseasonal rain but very welcome as the veld was under stress. Most of the dams got water but not enough to last the rest of the year. At a dam near Tremisana we see White and Black Rhinos almost every day taking a mud bath and feeding around the dam. 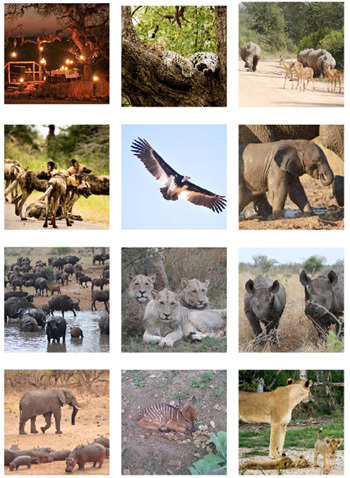 Game viewing in Balule has really improved over the last 10 years and is now one of the most popular areas. This month we saw so many animals almost every day like Elephants, Leopards, Hyenas and lots of general game. We left Tremisana Lodge early morning before sunrise to be able to hear all the birds calling to one other. A few kilometres from Tremisana we heard a hyena calling and we stopped to listen carefully. It called again and I knew exactly where it was – we drove straight to the area and we found two hyena on the road. Further on we spotted two lionesses walking on the road near Masodini and we then heard a roar from a male lion very close to us. Everyone was excited and looking forward to seeing a male lion. I went back and forth trying to find him, but it was difficult. A few minutes later we found him behind a bush, busy eating a male waterbuck, accompanied by some cubs and two lionesses. The jackals were around as well looking to get some leftovers but there was no chance. The spectacle was made even more interesting by the arrival of two large elephant bulls. They walked straight towards the lions and trumpeted. The lions scattered. The elephants spent a few minutes standing next to the carcass and looking at the lions. It was interesting to see lions run from elephants. It was a sunny day and everyone was looking forward to seeing many animals. Our first sighting was a female giraffe with a baby that was busy drinking milk from the mother. The month of April has been rather warmer than usual. We have had more rain than expected this month – even more than last month and this has been good for nature and our beloved game reserve. 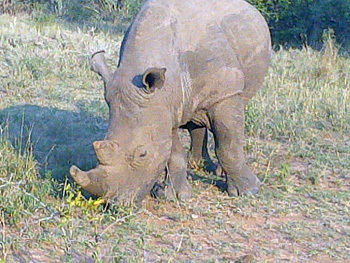 We have had some great and unexpected sightings this month which included two female black rhinos with a baby calf. I had brilliant sightings of leopards. We were also blessed to have a close-up sighting of one male lion with three lionesses and six cubs. On our way to the Olifants River to do the bushwalk, we spotted an elephant bull along Marula road. This was a wonderful way to start off our early morning. 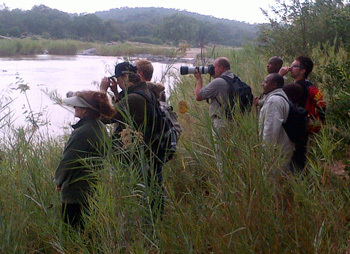 Whilst walking along the Olifants River we saw a crocodile and a hippo which delighted the guests. We also saw a Black Rhino at a nearby dam. The Black Rhinos are one of the most difficult Big Five to spot. On the way back from the Bushwalk, we were lucky enough to spot a leopard. It was lying on the branches of a Marula tree. What an exciting way to end the bushwalk ! During the Afternoon Drive we encountered a large herd of buffalo. We had to wait for some time as the large herd was crossing the road. I also conducted the Sunset Drive and we saw three bull elephants busy feeding. They came very close to the vehicle and one of the guests kept on insisting that we should leave the sighting because she did not feel safe. We drove down to a nearby dam and we saw two male White Rhinos. While doing the sunset drive we came across a large herd of elephants between Sable and Olifants road. Near the Marula Boma we came across a pair of porcupines – most unusual and extremely lucky ! This April we’ve had many more sightings of lions compared to last month when there were Wild Dogs to cheer things up. I think that the presence of lions causes the Wild Dogs to go away. Balule has been amazing : on the 3rd April, we had 2 vehicles on Sunset game drive. Bongani spotted a leopard walking on Sable road. He called me on the radio and my clients managed to see it briefly before it disappeared into the bush. I found another leopard at Xigamba dam. It was just sitting on the dam wall looking at a Grey Heron which was busy fishing in the dam. I drove very close to this male leopard and my ecstatic guests enjoyed the awesome sighting. After a few minutes, we watched him walk off the dam wall into the road and he walked on the road in front of our Landcruiser while marking his territory by spray (urinating). He walked up to Nkambaku Dam and started stalking some impalas near the watering hole but unfortunately he did not catch anything. 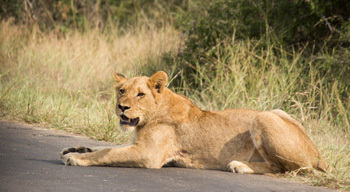 Kruger Park has been excellent this month with exceptional sightings of many prides of lions. 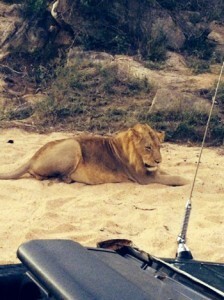 On the S125 there were five lionesses, two male lions and ‎a few cubs in the riverbed. They looked like they had eaten as their stomachs were so full. As we drove towards Satara, at the Nwanetsi River we saw three male lions feeding on a buffalo, killed next to the water. The Nwanetsi is one of the rivers that holds water for long compared to other dams so buffalos and elephants love this river. The carcass lasted the 3 lions for about 4 days so it was so simple to see lions that week. The following week we got seven in this pride. They were feeding inside a thick bush but two male lions were out near the road keeping us entertained. About 100m from the Lions there were two Cheetah sleeping next to the road. I think they took a chance as lions will eliminate other predators. ‎On the 24th April we started the day in Kruger with a great sighting of a big male lion walking with us for about 1km on the road near Orpen Gate. It was roaring while walking and the guests loved it! After lunch at Satara we saw six rhinos – it was very exciting to see so many rhinos at the closest range. They were grazing next to the car without paying attention to the presence of the open Gameviewer. I have just joined Viva Safaris and what an amazing month ! We saw so much ! So many stories to tell – the ‘Big Five’ sightings, the nocturnal animals, the big storms and scary evenings at the Marula Tree Boma where all of us were surrounded by elephants and hungry hyenas. All this excitement started when I had my very first Sunset drive. We came across two Black Rhinos (mom and calf) just before sunset, walking along the road. We followed them to a waterhole where there also happened to be 4 White Rhinos wallowing in the mud. In just 10 minutes we had seen six rhinos- something unheard of !!!! What a way to start my guiding career with Viva Safaris !!!! No one day is like any other. Every morning you wake up, not knowing what you’ll find that day. Even when you don’t see a lot of animals, there’s always something beautiful to look at like the amazing sunrises and sunsets, clouds and stars, and big thunderstorms just a few kilometres away with light flashing so brightly you could almost walk around at night and see everything as if it was daylight. We see fresh tracks on the ground and hear all the sounds of birds and far away animals like hippos. All part of a bush feeling you just have to experience. In just one month I had four leopard sightings, with two of them in one day. It’s quite ironic because the hardest ‘Big Five’ animal to find is the leopard, and this month I found more leopards than lions. I had a number of great elephant sightings this month. Some have been quite scary as the breeding herds near Tremisana Lodge have come really close to my Landcruiser. The guests don’t know that I even said some prayers the one time. The guests think it is great but I must admit I was a little nervous. Lions are so much more chilled than elephants. The big pride in the northern side of our reserve consists of one male, three lionesses and six cubs. We got them on Marula Road just as they walked back from an unsuccessful hunt. They walked so close beside the Landcruiser that if I had reached out my hand I would have touched them. I was not nervous and my guests went ballistic ! I never get tired of going on Bushwalks, because every day we see something new and exciting. It’s almost a guarantee that you’ll find hippos and the crocodiles when it’s a sunny day, when walking along the famous Olifants River. 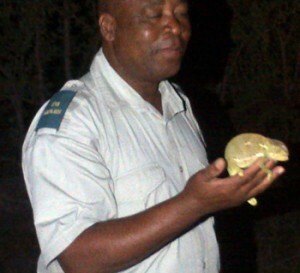 I think Rex and Bongani are absolutely brilliant on the Bush Walks! My first Sunset Drive at Tremisana was with seven pax and my first sighting was a female Slender Mongoose with her two offspring feeding on a Swainsons Spurfowl right outside Tremisana Lodge. A Black-backed Jackal came and chased the mongoose away. He then took the remains of the spurfowl and started eating greedily without sharing. It was so sad because the mongoose was very small compared to the jackal and were not able to fight the jackal. After that sighting we spotted vultures on top of a tree. I stopped to see if we could find something. We could all smell a very strong stench. I got out of the vehicle and started walking around trying to find the source of that smell. I had hardly walked for a minute when I heard a loud growl. I looked up ahead in the bushes in front of me. 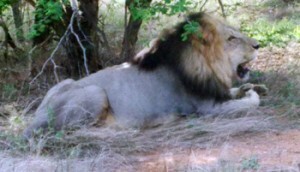 There was a male lion feeding on a buffalo carcass. I then slowly backed away and headed to the vehicle. I told the guests what I had seen and they were very worried and asked if I was okay. There was a twelve year old boy sitting next to me. He asked me if I was scared. I told him that I was okay and he said he was afraid just hearing the lion growl. If he had seen it he would have fainted. Everyone laughed. They all enjoyed the sighting. Our first sighting was of a male leopard near the Orpen Gate. We came across a White Rhino bull crossing the road. We drove for some time seeing a lot of general game such as zebras and giraffes. As we made our way towards Satara we came across a large herd of elephants. We then stopped at a waterhole and we saw some buffaloes drinking and taking a mud bath. On our way back after lunch on the S40 we saw four lions on the road. Near Satara two cheetahs were chasing some ground hornbills that took to the air. What a brilliant day! The usual quiet season maintenance of thatch roofs and painting of walls has started. The month of April has been a very different month for me compared to other months. I find it quite strange how the one thing that I fear the most is the one thing that I seem to encounter the most. I strongly suspect it is Mother Nature’s way of teaching me to make peace with my fears and get over them. One evening this month I went into the office to print out the next day’s guiding schedule. I usually do not switch on the lights. I just make sure the printer has paper and plug in and print. This is my normal routine. Unfortunately the printer had run out of paper. I switched on the lights to get extra paper. I got my paper and sat down to start printing. I looked at the window that is directly in front of my desk. There was something on the window. I quickly reached for my glasses. To my absolute horror there was a python on the window. Yes. A python – again. Could it be the one I almost stepped on a few months ago? Maybe a friendly visit to remind me that he was still around. I had forgotten to close that window properly. I almost lost my mind. I ran out of the office as fast as my little legs could carry me, screaming. It took me a few minutes to calm down. I remembered I had even left the doors open running for dear life. Strangely enough I remembered this would be an awesome picture. Crazy I know. I grabbed my camera and went back to the office with one of my colleagues, Audrey. I took some pictures and only started panicking again when the snake started moving. Thank God he made his way out of the office into the flower pot then out into the garden. It took a couple of days of sneaking into the office in the evenings just to get my sanity back. I think this is Mother Nature’s way of slowly exorcising my snake phobia. The more I encounter them the less adrenalin, the less the fear ! Piero, our GM, reminds us that snakes serve a “critical role” in controlling rodents – the only thing “critical” was my nervous condition !!! This month we also had a visit from a troop of baboons. This is the first troop of baboons I have encountered since I have been here. The little babies were very cute but the alpha male made me feel very uneasy. They are very big and they were looking very relaxed around the swimming pool. Thank God their visit was short- lived otherwise I would have been stuck in the office the whole day. To close off the month we had a visit from Soshangane the elephant. He came very close to the fence line. The guests we had in camp were very excited. As I prepare to go on my long leave for three weeks, I feel a deep sadness because this has become my second home. I will miss the bush and all my little adventures. I look forward to coming back refreshed and ready for another month of great excitement. We have added a wrap-around extended deck to treehouse 7. Not only will this enhance the viewing for our guests, but it will allow our staff to access the exterior glass window that the baboons found so appealing. These critters saw their reflections in the glass and generally messed up the place. Ronald says there have been fewer buffalo sightings and more rhino sightings. We have employed a full time gate guard. 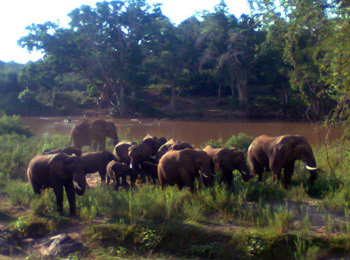 The security of Marc’s Camp and the Motlala Reserve will be improved. Sandra and I took a walk on the 9 hectare property across the road from the Cheetah Inn. 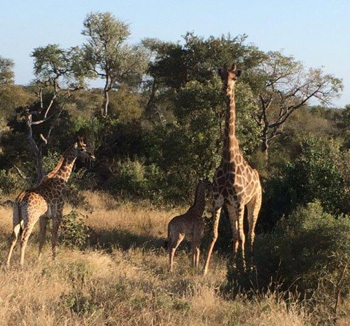 This property borders the Big Five Kapama Game Reserve and is open to a further 400 odd hectares which boasts a good variety of general game. I decided to further investigate some cement block foundations I had first noticed some 10 years ago. The foundations were overgrown and contained some (estimated) 25 year old knob thorn trees so it is a mystery who actually built them. I managed to re-locate 4 foundations, each 20 metres long and 4 metres wide. Ronald, Aron and Given , the senior members of Viva Safaris’ building and maintenance team, advised that whoever had built these foundations some 40 years ago (in their estimate) had done an exceptional job. We had the areas cleared and I am now very seriously considering building a camp. We already use Pondoro and Ezulwini for our Five Star luxury safaris and we are very happy there. My thinking is to build a 4 star Tented Chalet camp. This will neatly fill the gap between Tremisana and these luxury lodges. There is ample space and each of the possible 8 units will have a floor area of 40 square metres – more than enough to build something really good. Keep watching this space. I am pleased to report that we invited three travel agents to experience our product this month and all were very happy. Please let me know if you wish to visit our lodges to evaluate what Viva Safaris does – it will be a pleasure to host you. All three agents rated the 4 h Bush Walk as their highlight – it really is very exciting. I reckon that guests should be encouraged to book the 4 day safari instead of the 3 day one – the Bush Walk will make it worth their while ! 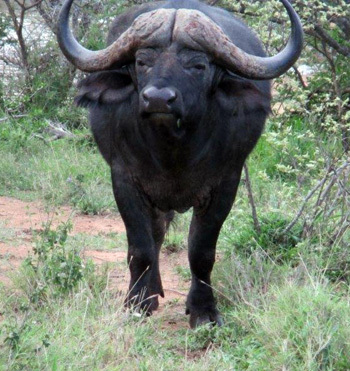 These Bush walks are the real deal – genuine Big Five walks and not some inferior “Nature walk”. A most delightful and unusual place to stay. Marc’s Treehouse Lodge is more like an adventure camp. If you’re looking for luxury, or a place to chill out all day, or leisurely hours spent by a pool after your morning safari drive, there are plenty of other lodges to cater for you. To stay at Marc’s, you need to be up for a bit of physical activity, to enjoy basic but nutritious communal meals served in the indoor/outdoor area, to be able to walk down dirt paths of varying gradients to your cabin, and to be amused by monkeys stealing your 7am breakfast muffins before you head off on another Viva Safari adventure. My friend and I were here as part of our Viva Safaris week, and this turned out to be the highlight of our African holiday. It was refreshing to have such a different kind of experience. We were especially impressed with Jeanette, the ‘camp mother’, who organised us each day, making sure everyone was up in time for breakfast, providing a packed lunch for those who were late –though we probably shouldn’t encourage that habit! Our week there coincided with the start of the long awaited ‘rains’, and on a particular night a fierce thunder storm with torrential rain. The staff were excellent at getting us quickly fed and away to our room before the inevitable power cut. Most cabins are in the style of the original treehouse rooms – rustic and basic with the thatched roofs, suitable to the adventure camping nature of the Kruger Park experience offered by Viva Safaris. I would fully recommend this to young or young-at-heart folks who don’t mind an action-packed week with walking, climbing, and very early starts. Kudos also to Margaret, Vanessa, Adam, Alistair and all the terrific guides and camp staff who made our week so excellent, hence my five star rating! We just finished a five day safari via Viva Safaris with our HQ at Marc’s. What a perfect little location to explore the amazing sites of Kruger. Stayed in one of the treehouse cabins which was the ideal balance of nature and creature comfort. En suite bathroom and comfy beds made for great rest after the long days. And the location in the trees above a river watering hole meant we felt really a part of the bush. The food for breakfasts and dinners was excellent and the open dining area made for the perfect place to relive the stories from each day. By far the best factor in our stay however we’re the people. Guides like Mayneth, Rex, Vanessa made the excursions unbelievable and shared so much knowledge. The crew at the lodge like Jeanette and Pretty made our lives so comfortable when we were back from our adventures. Trip of a lifetime, much to do with the friendly faces and amazing location of Marc’s Treehouse and the Viva crew. Highly recommended. Intimate guest lodge surrounded by nature. Staff were incredibly helpful. Beautifully designed rooms to match the surrounds. Our night drive game ranger was had a vast knowledge of the bush and all its creatures. Candlelit dinner amongst the stars was the perfect way to spend our last night in this slice of heaven. Tremisana Lodge was our first night stay over on our very first visit to the Kruger area. This trip was with Viva Safaris. We had a lovely comfortable room. The gardens were well kept and very pretty. On arrival we were taken on a night safari of the camp and then off to have a late dinner at the outdoor boma. The next day we went on an early morning 3 hour bush walk with Mike and Bongani. We were very impressed with the knowledge that Bongani could share with us. Then later that day we again went on a safari drive. During all our outings we were overwhelmed by the beauty of these great creatures, and the many smaller animals that live in the bush too. The 3 lioness’ and 6 cubs were the stars of the night trip, the Elephants and Rhinos the next day and the Zebra and Giraffe and especially for me, the owl on the night drive. We want to thank Mike and Bongani for these wonderful experiences that they shared with us. We could recommend this lodge and safari trips to anyone wishing to see the Big 5.